Let us congratulate OnePlus 3 cos it's been recorded as the most powerful smartphone for 2016. 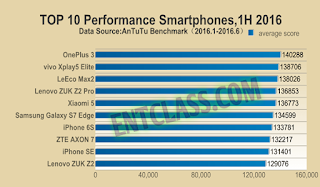 Though the year is coming to an end but Antutu has released a report that shows the most powerful and strong smartphones for the year 2016. 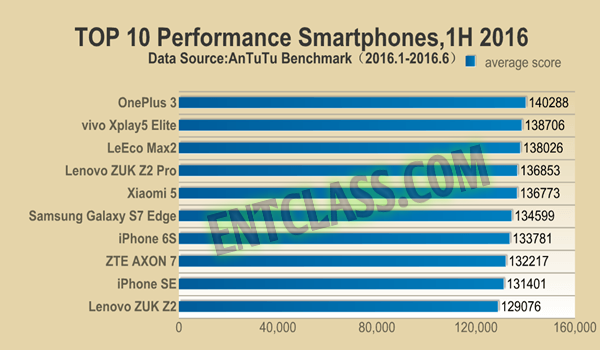 This report is being fetched from the average scores of benchmark tests made on these smartphones which OnePlus 3 won the test. As you can see the list above, popular Samsung Galaxy S7 Edge didn't perform too well as it took 6th position in the test. As we can see, all these smartphones are all snapdragon 820 chip & 4 GB of RAM, except the OnePlus 3 that carried 6 GB. While the runners up are Chinese brands. How can I purchase it pls?